A versatile working ranch horse, Patchy instilled his outstanding traits in countless progeny. Patchy is known not only for his own stellar traits -- color, conformation, disposition, heart and performance -- but for his ability to pass these traits on to future generations. Patchy is thought to have been foaled in 1939, though some reports show it could have been as early as 1935. 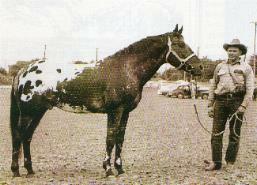 Patchy was owned by Guy Lamb of Lewiston, Idaho, then by Herb Camp of Washington state from 1942 until former ApHC director Ben Johnson, of La Veta, Colorado, purchased him in 1950. Mrs. Jimmie Imboden and her husband, Don, bought a half interest in Patchy in 1961, and the stallion stayed with them until his death of an apparent heart attack on March 17, 1963. In his own right, Patchy earned grand champion stallion honors at the first National Show held in 1948 at Lewiston, Idaho. At the Quincy, California, Nationals in 1952 -- the days when performance division classes were all held in one evening -- he worked 11 of the 13 events, including the one-eighth, one-quarter and one-half mile races, winning the National champion performance horse title. It's said he did it all without sweating up under the saddle -- and in his teens, no less. His National get of sire titles include a first in 1953 and reserves in both 1955 and 1959. He was named the premier sire of performance horses in 1960. Though Patchy's stud services were never widely advertised, he sired 84 registered foals including three national champions: Gypsy T-93, 1951 champion mare; Blitz F-1251, 1953 reserve champion stallion; and Patchy Jr. F-1380, 1954 reserve and 1955 champion stallion. Other notable get include Keeko, Patchy Pete, Patchy's Warrior, Patchy's Nugget, Kathy and Lolo. His memorable grandget include Shavano, Double Patch, Toby II's Patchy and Patchy Jr.'s Lila Gleska.